The Somers Supermart in St George stocks a slightly smaller range than the Supermart in Hamilton. However, any of the products available at the main store can be ordered here. In addition to serving local residents and tourists staying in nearby accommodation, the Somers Supermart specialises in deliveries to yachts docked at St George. 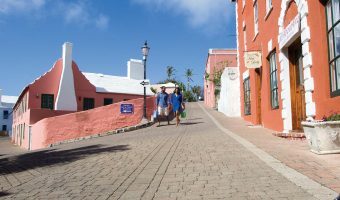 The store has a bakery, full-service meat counter, a deli offering Bermudian cuisine, and an extensive salad bar. Store hours are 7 am to 9 pm Monday to Saturday, and 8 am to 7 pm on Sunday. Map showing location of Somers Supermart. Guide to supermarkets and grocery stores. Includes opening times and location maps. Also includes an explanation of why groceries are so expensive in Bermuda. Find out everything you need to know about the town of St George. Our guide includes details of hotels, things to see, restaurants, shops, events, how to get there, and a map.